GC: What corporate actions trends are you seeing globally, and how is it impacting what clients are looking for? KE: What we have seen over the last nine months is there has been a significant uptick in volumes and client requirements. A lot these organisations have been unable to fulfil the requirements just by adding more people into the process. This is driving the move to digitisation as a lever to support the new processes and demand by an increasing tech savvy and mobile client base. With the need to carry out corporate actions processes faster and more efficient rather than through traditional deployments, clients are using SmartStream, where we are working with our cloud-technology partners, to deliver these types of solutions in weeks not months. GC: What investments have you made into your corporate actions services? KE: We have made a tremendous amount of investment into the product over the past couple of years. We looked at the market and their needs, and have seen a shift away from the heavy deployment into a more light-weight software-as-a-service (SaaS). We have made significant amounts of investments in that area, and clients are absolutely embracing it, they prefer the faster deployment model and less of reliance on heavy weight support requirements within their institutions. GC: With the majority of global regulations now rolled out, what are clients looking from you? KE: The first is digitisation of banking, which is driving a lot of the investment to understand operational efficiencies, which is a critical competent with the pricing pressure our clients are experiencing in the market. Corporate actions has been a very manual process for a lot of institutions, and digitisation has shone a focus on those previously-left alone manual processes. Coupled with the regulations, and even though they are not particularly focused on corporate actions, it is giving sell-side institutions and the buy-side an understanding of what they need to report, what holdings do they have, and do they understand the nature of their holdings the requisite reporting regulations and jurisdictions they may need to address. Thirdly, the clients of our own clients expect the latest software and technology, including real-time access as well as the expectation of self-service and reporting. That is helping to solidify some of the business cases around these projects, not just from operational saves but downstream customer services aspects. GC: What value is there with providing clients independence over their data as they move to a more digitised world? KE: The main benefit we see is that it gives them agility. Financial institutions (FI) are moving away from a very structured, waterfall approach to bringing out new products and services. The competition is higher, the regulatory timeframes to do these are limited, so a lot of those institutions need to adopt an agile approach where they need to test, try and deliver these services and work through them quickly. GC: Looking at the next 12 months, will those themes continue to be a focus? KE: These themes will continue, and unfortunately, I don’t think MiFID II will be the last regulation we see in the foreseeable future. The regulatory supervisory bodies are now starting to understand in greater detail the nature of the interconnectedness of the financial system, and this understanding is only going to increase the requirements for further informational flows and reporting. There are also some big changes being deployed in the core messaging processes between FI to facilitate this increased reporting and new workflows, some of which require a reworking of the data architecture of the solution provides in the market to support the enhanced workflow capabilities. 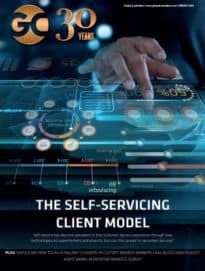 With regards to new technologies, it really is the consumerisation of the enterprise solution stack, both internal stakeholder and external stakeholders are seeing the acceleration of consumer-based technology in their daily lives, with attractive interfaces, always available data and enhanced workflows. To attract and retain both clients and internal supporters the enterprise solution providers must begin to provide a similar experience to compete for a voice or share of mind. They must understand what market changes these new technologies might bring to their industry and the investors that support them.